Utilizing both organic and electronic sounds, Oh, Yuck is wrought with textural soundscapes grounded by programmed orchestral compositions, sprightly guitar lines and thrashing drums--productions that are never overambitious or dense, but purposeful with each synth layer, each woodwind arrangement. “Stomping Ground” builds off of a dexterous guitar riff, displaying Verrett’s skill as a seasoned math rock guitarist. Lyrically, Verrett puts traditional R&B tropes in a funhouse mirror and warps the genre’s bravado into a parody of itself, displayed on “Idiot Soul,” a sultry and sulking mid-album track that presents an entitled antagonist toying with romantic interests. 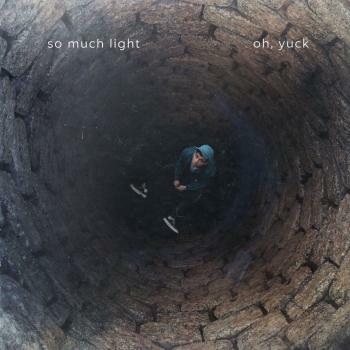 While heavily influenced by a range of musical styles, including progressive rock, Oh, Yuck is grounded by an R&B stronghold. But all the while, Verrett’s relationship with the genre has been one of complication. After an elementary school education in saxophone, Verrett picked up guitar in adolescence at 12-years-old, beginning with lessons from his father, who played in Rhythm and Blues bands, and eventually teaching himself Led Zeppelin, Metallica and Iron Maiden solos. Two years later, he turned his interests toward electronic music, creating note-for-note recreations of video game soundtracks. Though a good foundation for his technical skill, Verrett found more of an emotional connection in R&B, especially R. Kelly. With that in mind, he set out to create music that achieved both sensuality and propelled a positive-leaning message; to be a new brand of socially conscious artist. Despite the political inspirations on “Be Afraid,” much of the album was written between 2012 and 2016 following Verrett’s graduation from University of California, Davis. In his bedroom at his parents’ house, not far from Sacramento, he’d tinker on his computer, creating productions based on the sounds he’d imagine in his head. He’d learned in his early teens to think beyond the traditional guitar-bass-drum sonic palette and realized sometimes what a song was lacking was perhaps a flute tone or a lush manipulated piano chord progression. Layer by layer, sound by sound, Verrett would build each composition from a concept in his own imagination to an audible reality. Lyrics would come later, an equally time consuming process. Sitting in his closet with a microphone, he’d record his vocals with many of these takes utilized on final Oh, Yuck mixes. Only some of the vocals and live instrumentals were re-recorded in a studio in Omaha. But it was in his room, wondering what it was he “should” be doing with his life, that Oh, Yuck was born. His parents, meanwhile, were supportive of their son’s craft, enabling him to experiment freely without judgment. Verrett’s father, who grew up performing with his brothers, always encouraged him to pursue music. In a small suburban bedroom, So Much Light was born, an amalgam of man and character, story and history, natural and manipulated. Using his voice as a tool for progress, Verrett effectively pushes the boundaries for what pop music should sound like--and what it should say.